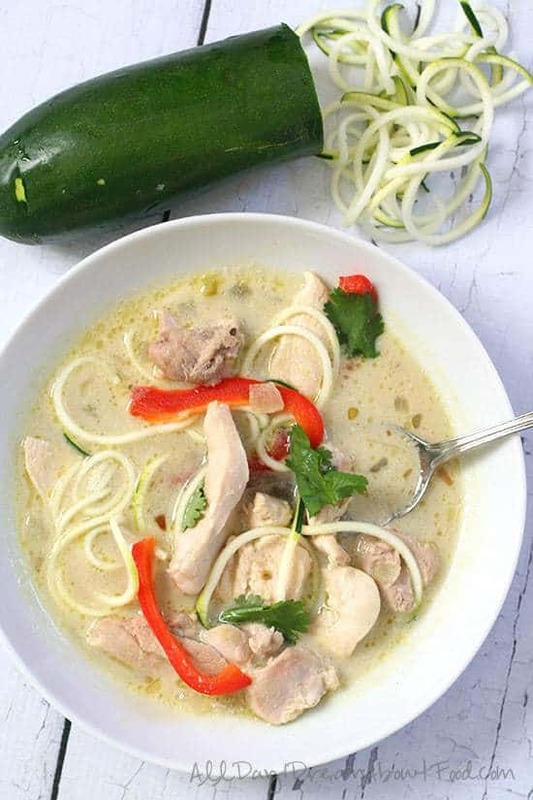 If you’re starting to feel a bit bored with your low-carb diet, it’s time to mix things up a bit by mixing up some new low carb soup recipes that include a variety of foods. Soups are a great way to break out of a rut because they’re so versatile. Have a small bowl alongside your meal or fill up a bowl with a hearty soup for a meal in itself. While many soups are naturally low-carb, some of your old favorites are full of noodles and potatoes, which are generally off-limits in the low-carb lifestyle. 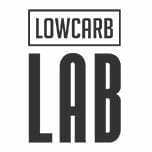 Related: See all our delicous low carb recipes. Missing mom’s famous chicken noodle soup when you’re feeling a bit sick? Time to bring in a new standard. 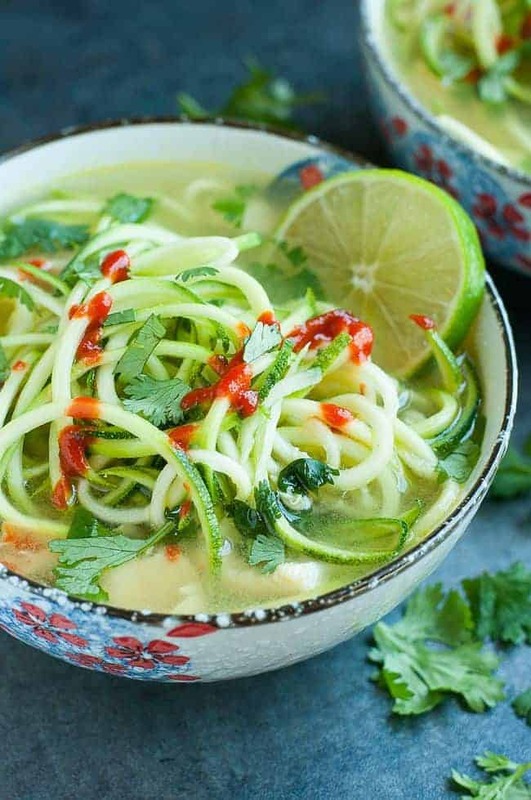 Instead of the carb-heavy noodles you typically find in chicken soup, this low-carb soup uses “zoodles” – noodles made from spiralizing a zucchini. 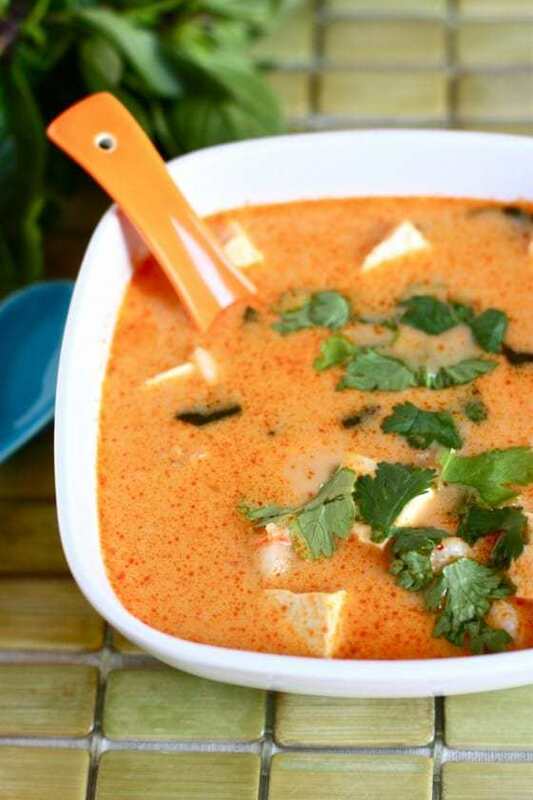 The spiciness from the curry and the creaminess of the coconut milk are a delicious blend in the soup. It’s just what you’d expect from a Thai-inspired recipe. 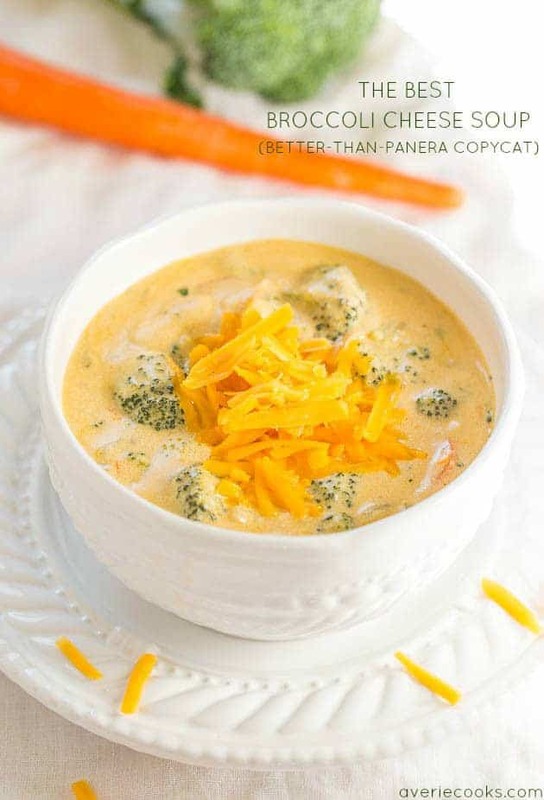 If you’re a fan of the broccoli cheddar soup at Panera Bread, you’ll love this recipe, which the writer claims is better-than-Panera. It’s rich and creamy, but you can also make modifications to suit your taste. For instance, the recipe calls for fat-free half-and-half, but if you only have whole milk on hand, you can use that instead. The spices really make the dish complete, so don’t skimp on them. 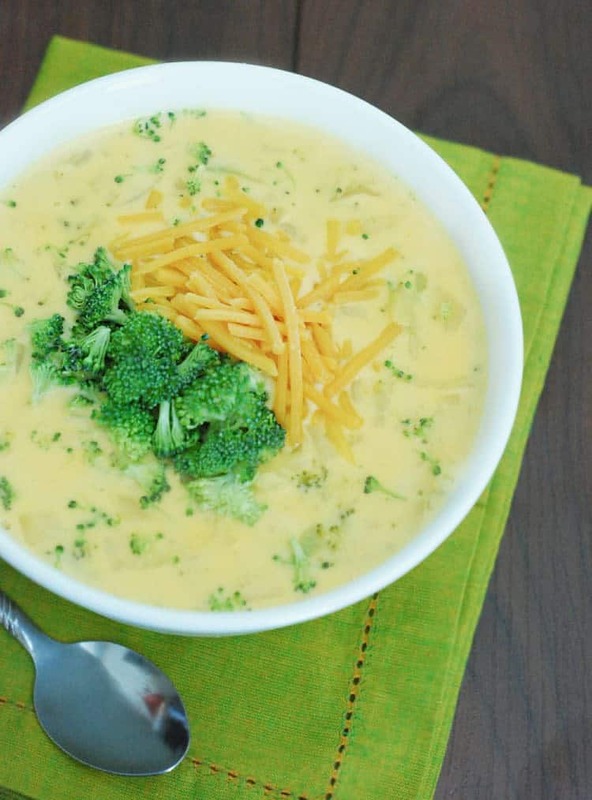 Since broccoli is one of the most filling low-carb foods, don’t be afraid to pack this soup with the yummy veggie. A creamy chowder is the perfect meal for a chilly day, and you’ll want to dig into this version. 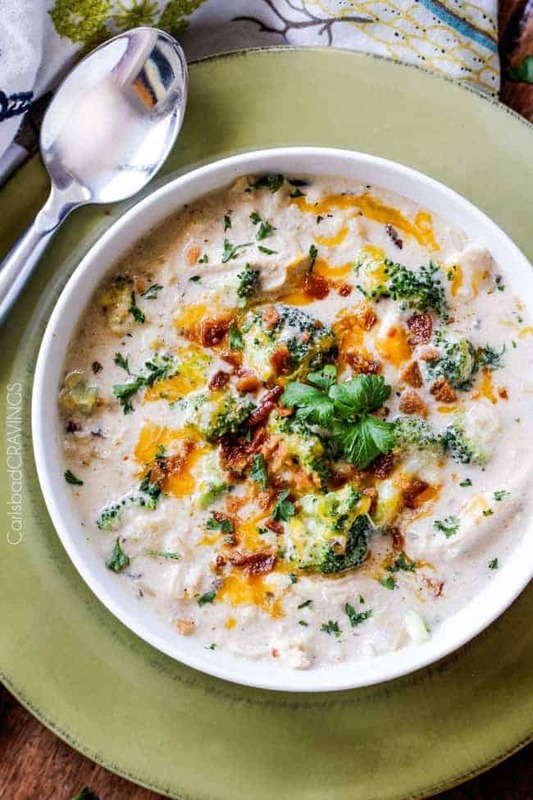 Using cauliflower in place of the broccoli makes it a carb-free soup, so there’s no guilt at all in having a second helping. Bacon crumbles on the top add the flavor that everyone in the family is looking for. You might even find that this simple recipe is a good way to get your kids to eat some more veggies. Chicken soup with a twist? You bet. 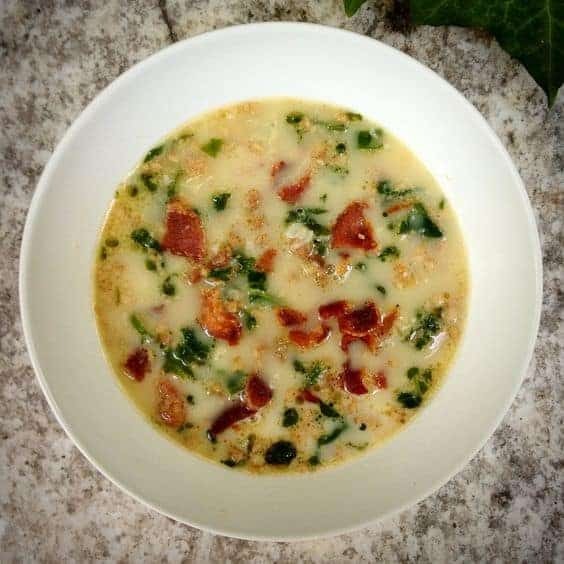 The cream cheese in this low-carb soup recipe lends a unique taste to the soup, while the spices and hot sauce give you the flavor of your favorite bar’s chicken wings. Fortunately, large chunks of chicken throughout the soup give the soup some heft, so you’ll avoid feeling like you’re eating pureed chicken wings. 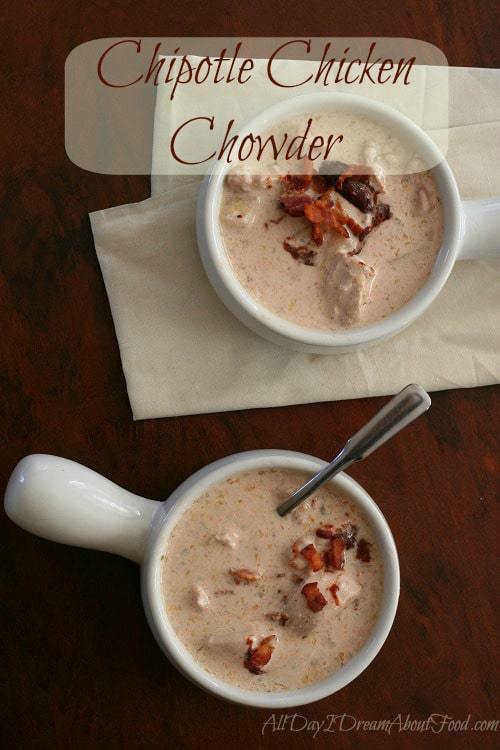 With bacon and cheddar, and the spiciness from the jalapeno, this delicious carb free soup really hits the spot. It’s the seeds of the jalapeno that add the heat, so you can tone it down by removing the seeds, or keep it spicy by leaving them all. It makes use of celery seed, which isn’t a spice that most people have in their cupboards, but it’s worth the purchase. Chances are, you’ll want to make this soup again. , so all you have to do is throw in the ingredients and come home to the delicious smell wafting through your home. Browning the sausage before you add it to the crockpot does take a bit more time, but the additional flavor is worth the effort. 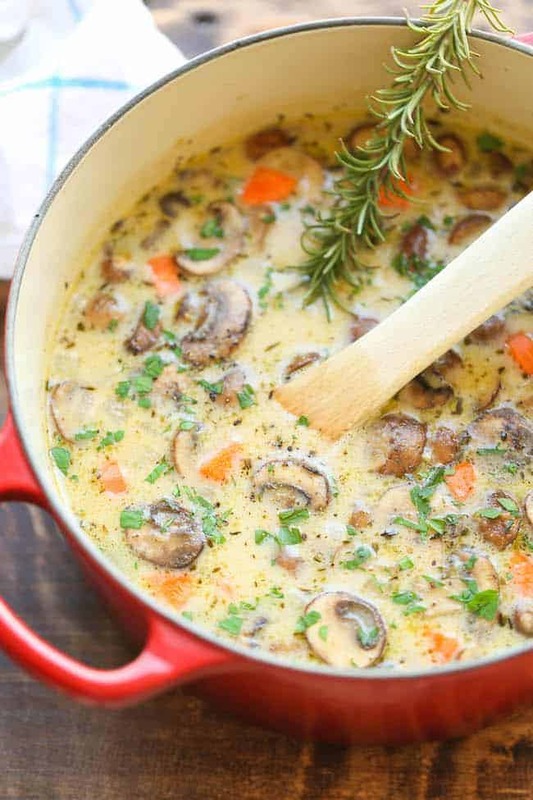 If you’re looking for a low-carb mushroom soup, give this delectable recipe a try. Mushrooms are a good way to get some vegetables in if you don’t really consider yourself a vegetable person. The hearty, earthy taste appeals to many people. 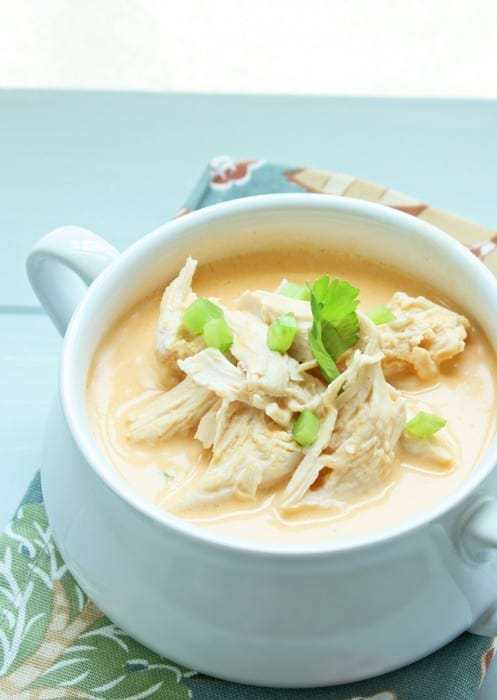 When paired with the richness of the chicken broth blended with the cream in this recipe, it’s sure to be a hit. Note that with a cream-based recipe like this, you can make adjustments to the taste or calorie count. Using full cream adds calories, but a deep flavor. Half-and-half is usually a good calorie bargain, but you can often use milk to reduce calories. 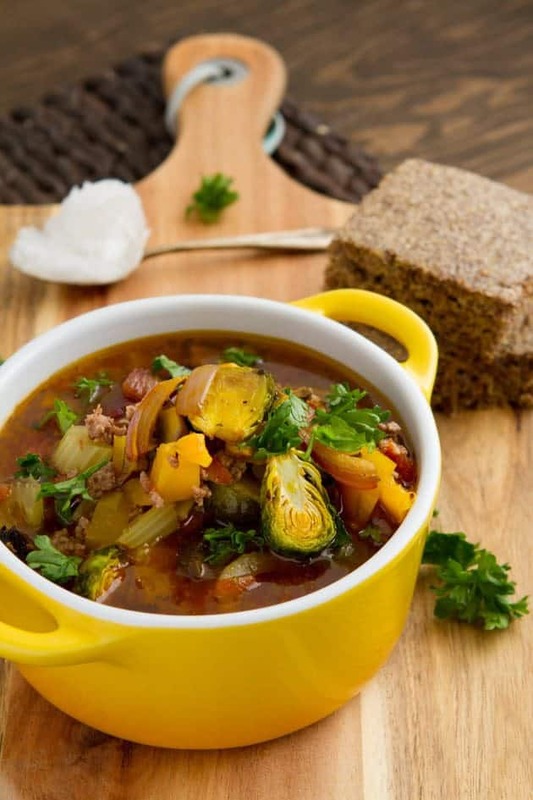 Since many people who want to eat low-carb use a lot of meat in their meals, it’s sometimes hard to find a good vegetable soup that’s filling. 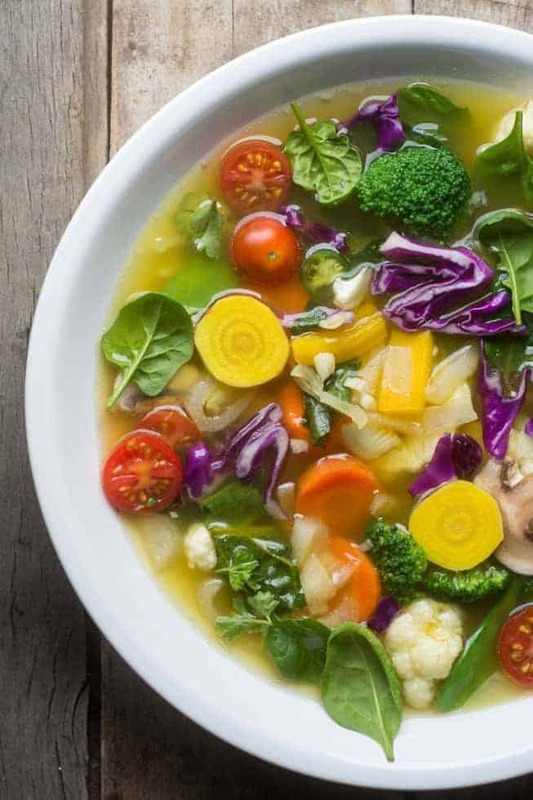 Broth-based soups might be low in calories, but they aren’t going to keep you satisfied for long. 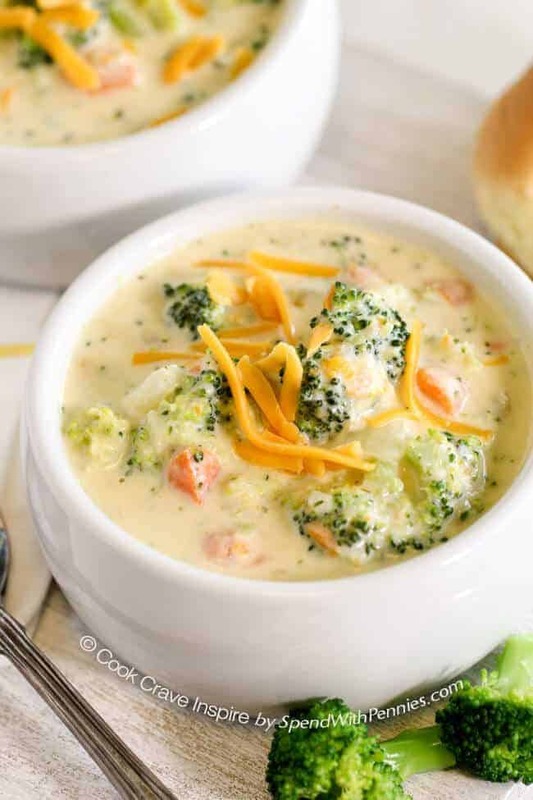 With the heavy cream and cheddar cheese in this soup recipe, you’ll have the protein and fat you need to stay full. It also has a deep flavor that will have you coming back for more. , but you can also prepare the ingredients for the soup and store them in the freezer so that it’s really easy to get this started. 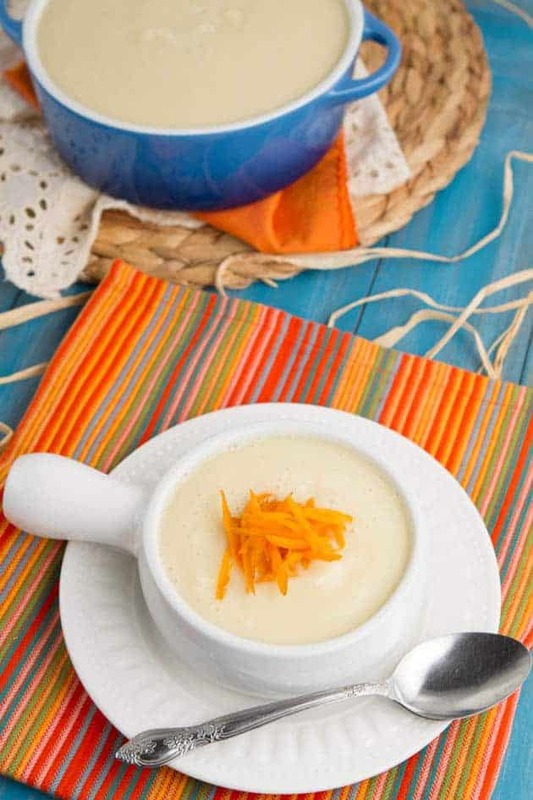 The Asiago cheese in this bisque adds a unique flavor to this comforting dish. As is, the recipe is good as a side dish for someone who’s in the later stages of the low-carb lifestyle, but you can make this a carb-free soup by using cauliflower instead of the potatoes. You won’t lose any of the rich taste, but you won’t have to worry about the carbs. 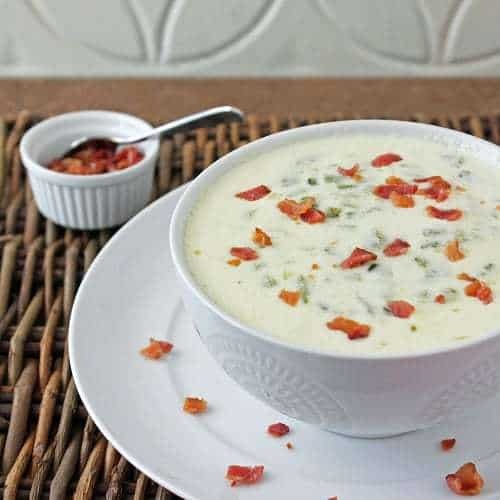 A touch of bacon is the perfect addition to the cheesiness of the bisque. 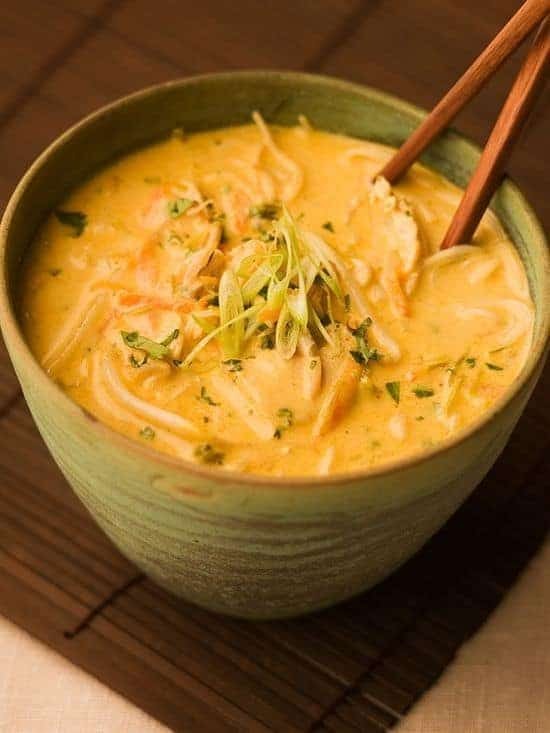 Creamy coconut blended with the spicy curry gives this soup the taste you’d expect from a Thai restaurant in a soup you make from home. This is easy to throw together when you’re looking for a healthy lunch in a hurry. The red curry paste is the most difficult ingredient to find, but most grocery stores these days have at least a small Asian food section that will have this product. 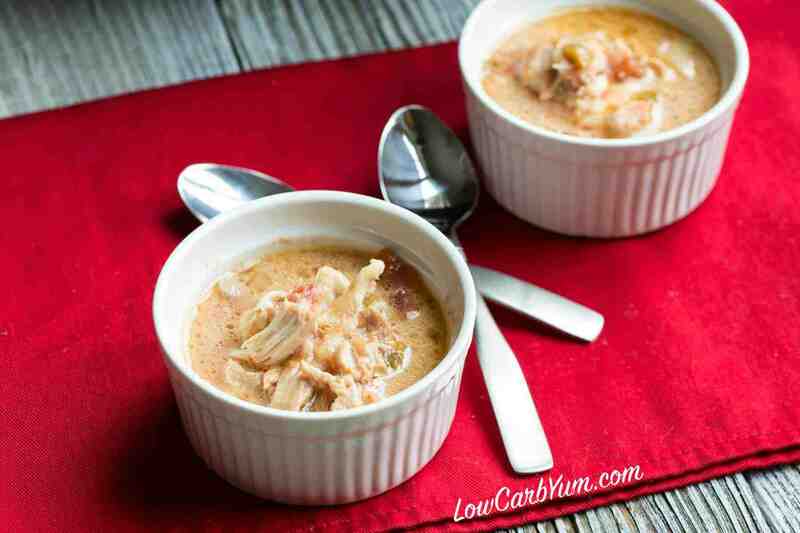 To make it a truly low-carb soup, omit the Basmati rice. yet, it’s time to get yourself one. It will make it easy to follow a low-carb diet when you can make pasta substitutes from healthy vegetables. This twist on the classic chicken noodle soup will certainly spice up your taste buds. You add the Sriracha hot sauce at the end, which makes it easy to customize the bowl depending on how hot you want it. Traditional minestrone soup is full of noodles and beans, which don’t exactly make it a carb-free soup. However, this version gives you the taste of minestrone soup without those carbohydrates. Rather than adding the noodles and beans, you simply add shredded chicken pieces. The recipe makes use of a lot of summer vegetables, so it’s a fantastic way to use up the abundance of vegetables you’re getting from your garden. 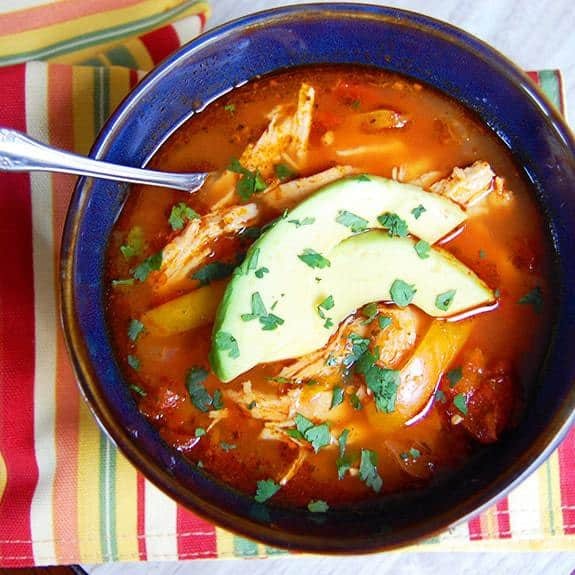 A jar of salsa gives this easy-to-make low-carb soup recipe its Mexican flavor, so you don’t have to worry about adding a lot of spices on your own. The hardest part of making this soup is shredding the chicken at the end, so it’s a great meal idea for those days when you know that you’ll be too busy to cook up something healthy. The kids might love this paired with quesadillas, while you enjoy a double-helping to avoid the carbs. Low-carb soup recipes can be broth-based or creamy, and this recipe is definitely on the creamy side. You might find yourself wondering if you could really consider it a “soup” since it feels more like a chicken pot pie without the crust. However, that’s probably what you want. Chicken pot pies are a classic comfort food, but the flaky pie crust would be a no-no for most people who choose to eat low-carb. This way, you get the creamy deliciousness of the insides without messing up your diet. 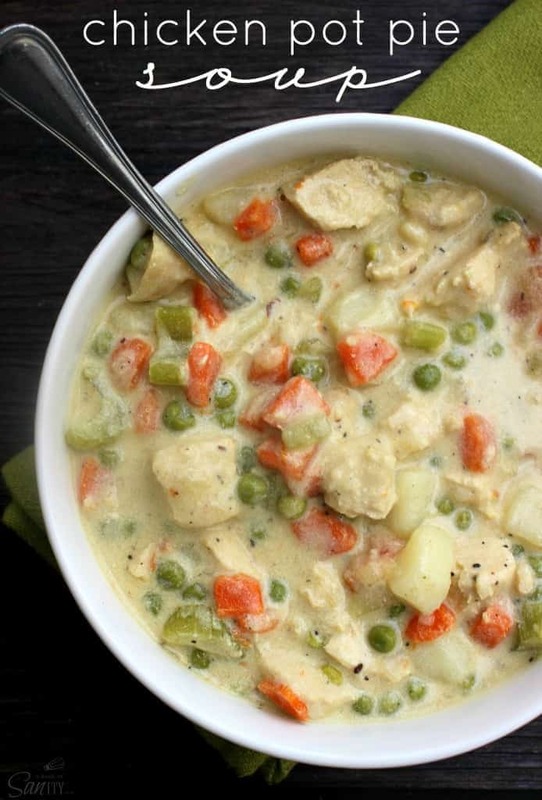 Creamy and spicy, this chicken chowder will warm you up on a cold winter’s day. The chipotle peppers add a unique taste to this carb free soup, which is nice when you’re starting to feel a bit bored with the traditional flavors of the soup. What’s really nice about this recipe is its versatility. Use fresh chicken if you have that available, but you could also use leftover chicken or turkey instead. Making a soup is a great way to use up any leftovers you have. 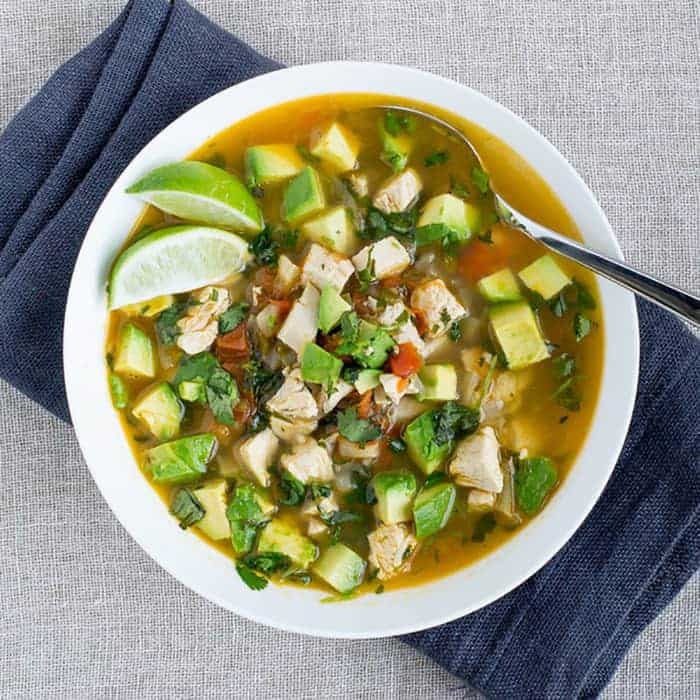 You don’t often find avocado in a soup, which makes this Mexican-inspired low-carb soup a refreshing change. With their healthy fats, avocados are a good addition to anyone’s diet. The jalapenos really give it some spiciness, which you can tone down a bit if you’re not into the heat. 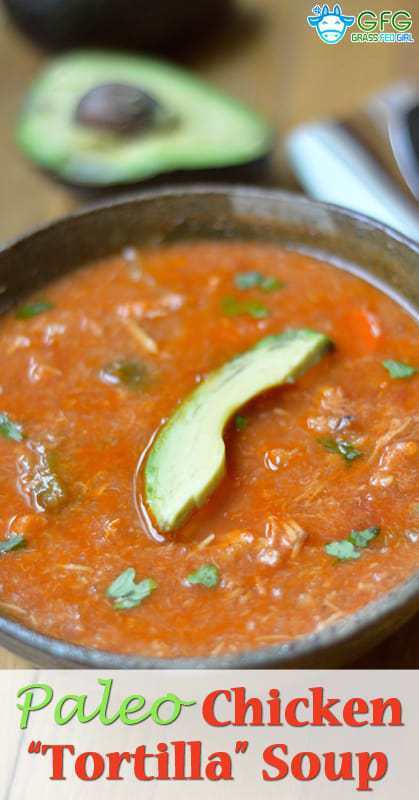 If you’re going to save some of this for later, be sure to save just the soup and add the avocado later. Otherwise, it might turn brown and go bad, even with the lime juice. 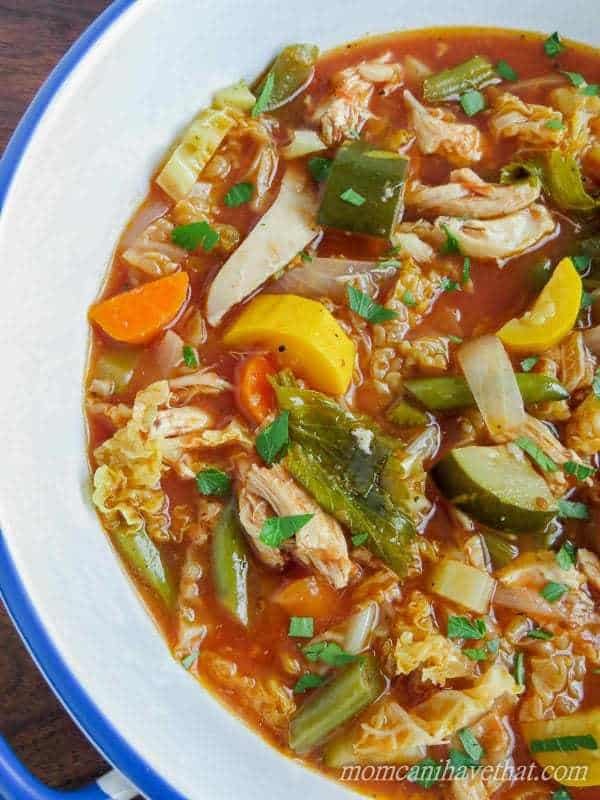 This low-carb vegetable soup is packed full of healthy vegetables, but also has chicken and bacon for some added flavor and heartiness to keep you full. Take this recipe and make it your own by adding whatever vegetables you prefer or happen to have on hand. In fact, you could use this basic recipe as a way to clean out the refrigerator at the end of the week.
. Using fat-free half-and-half reduces the overall calorie count of the soup, but fat-free versions of products are typically higher in carbohydrates. Read the labels and switch to a higher fat version if that’s better for your eating plan. By blending the cauliflower, then add the cheese, you’d hardly know that this soup is so full of vegetables. 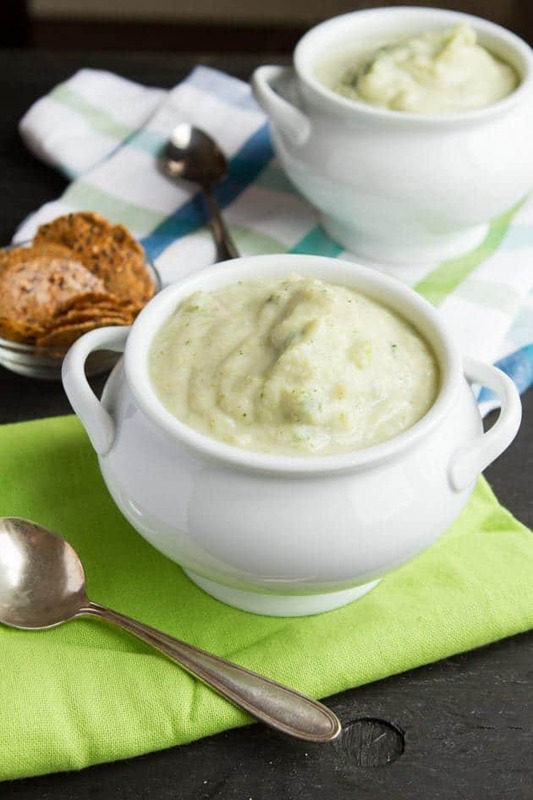 Another take on the idea of using cauliflower in place of a high-carb food – in this case, potatoes – this yummy low-carb soup is sure to please a crowd. Cream cheese gives it a lighter taste than something more flavorful, like cheddar, which can be a welcome change. Dill spices are a unique choice, giving the soup an unexpected flavor. 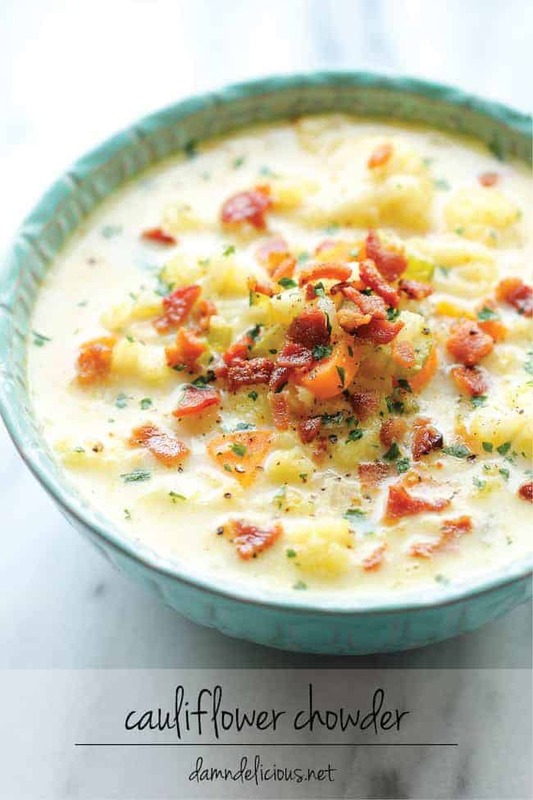 This recipe was originally made as a copycat recipe for Panera’s potato cream cheese soup, which is now retired. Easy is the name of the game in a lot of low-carb recipes, and this recipe isn’t any different. Perhaps the easiest aspect of this is the idea of using a pre-made skillet sauce mix by McCormick’s. These packages have all of the spices you need to get that enchilada taste. It’s a good solution for those who don’t want to have a lot of spices on hand or who want to be completely sure to get the right taste. There’s no guessing when you use spice packets. Heat things up with this no carb soup. 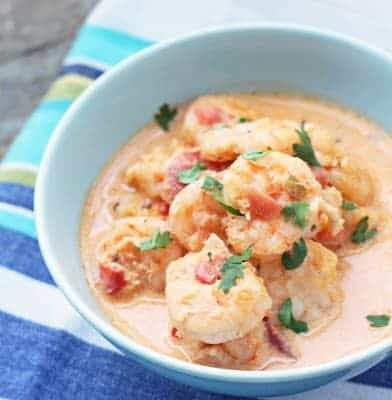 The spicy curry broth will stoke your metabolism while the shrimp offers the protein you need to make this soup a meal. The original recipe uses rice, which you can omit if you want to reduce carbs. Alternatively, swap in grated cauliflower for a bit more texture with each bite without adding to the carb count. See our healthy and delicious Paleo Crock Pot Recipes that you can easily prepare for the whole family. 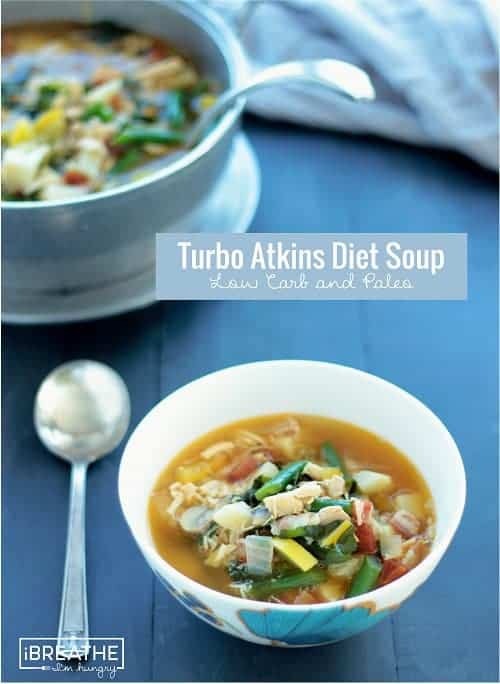 Anyone looking for soup recipes with low carb foods probably wouldn’t expect to find a soup with rice in it. However, wild rice is a healthy whole grain, and it’s fine in moderation in the later stages of most low-carb plans, so you shouldn’t consider this recipe completely off-limits. 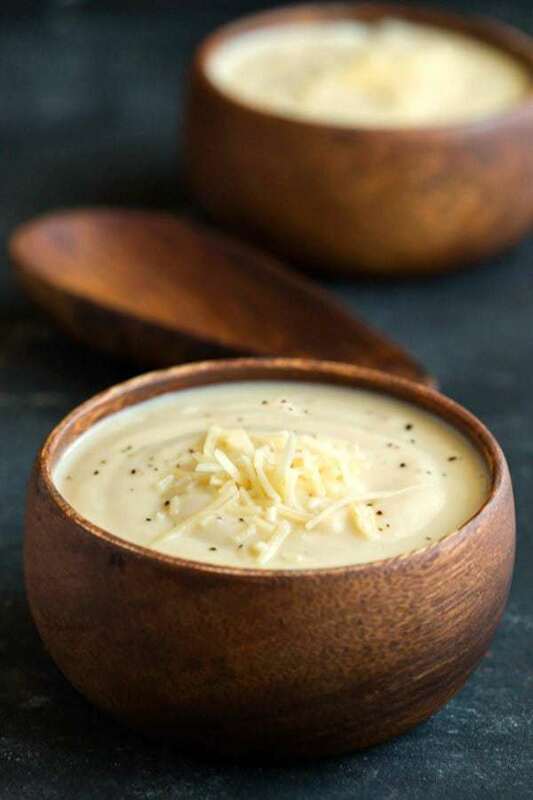 With half-and-half, a premade alfredo sauce, and shredded cheese, this soup is the ultimate in decadent creamy cheesiness. 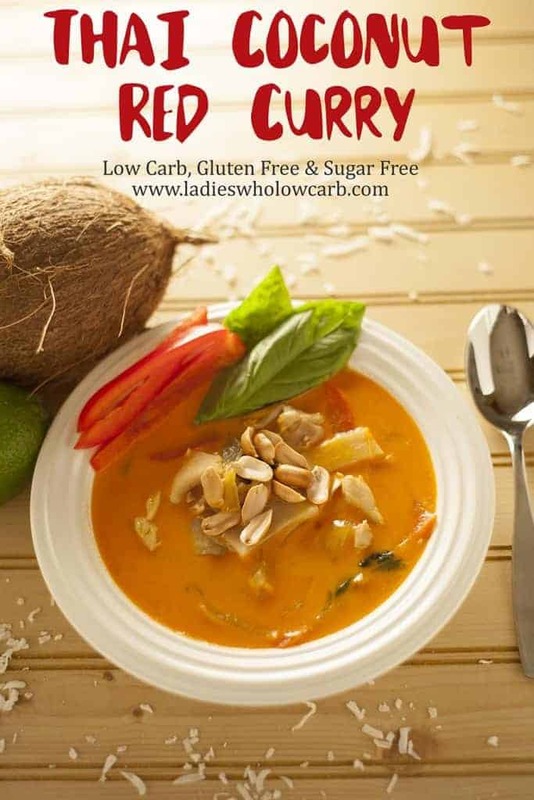 It’s hard to find low-carb soup recipes that are also vegan, but this recipe fits the bill. 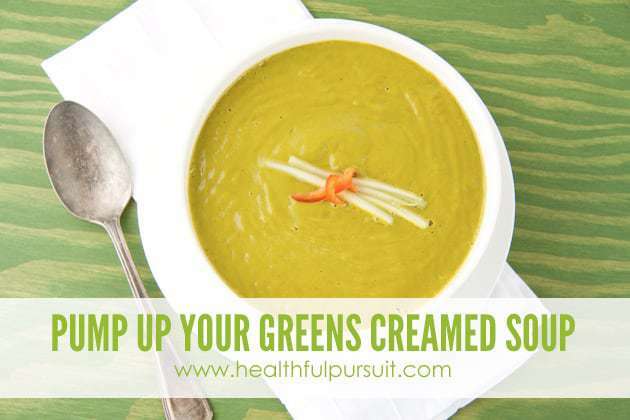 How can you make a “cream of” type soup vegan, you may wonder? The secret is in blending healthy macadamia nuts in a high-powered blender. This makes a surprisingly cream substitute that fits makes the recipe super delicious. Serve this alongside a salad for a healthy, filling meal. Jalapeno poppers are typically covered in breadcrumbs, which means that they won’t make any list of low-carb foods. 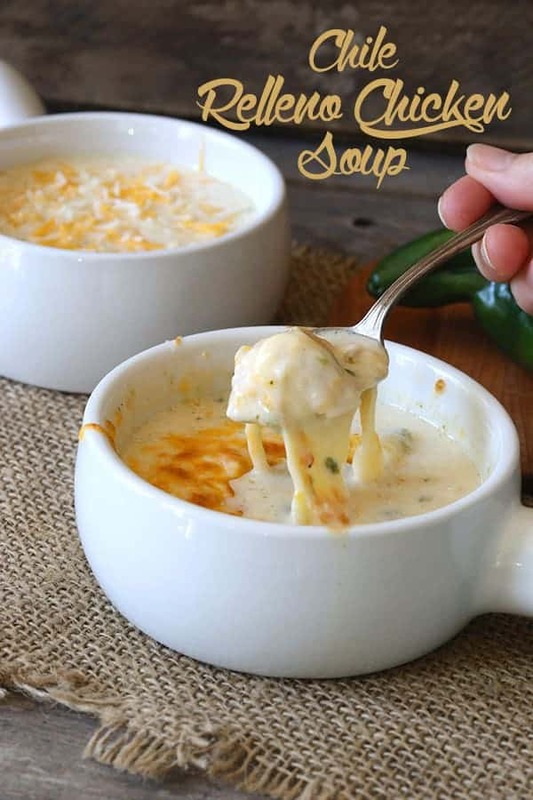 However, this soup recreates the taste you love in the cheesy, spicy poppers and a low-carb way. 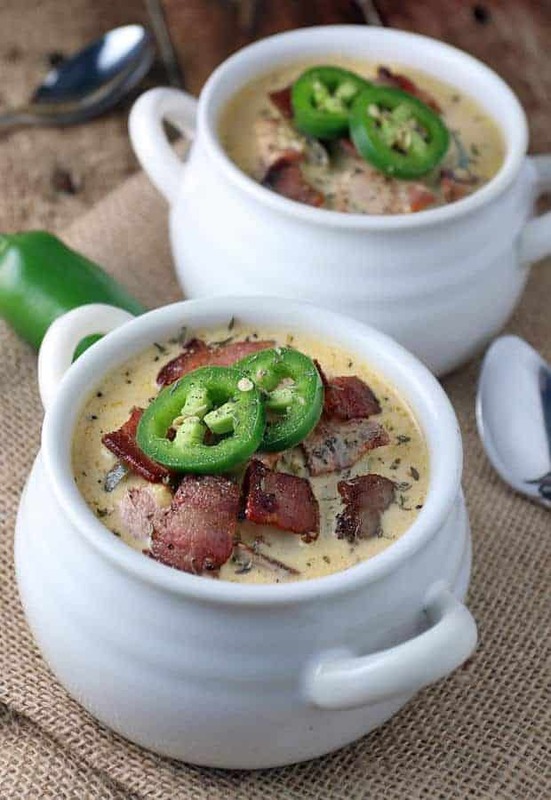 It’s creamy and comforting, and you can adjust the heat to your personal taste by increasing or decreasing the number of jalapenos you use. 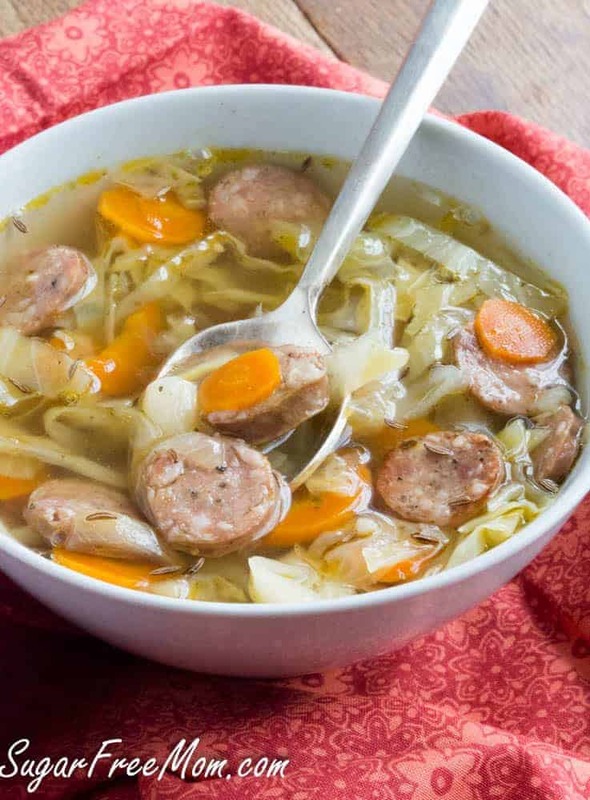 Sweet sausage in this creamy soup is a departure from chicken and will ensure you won’t miss the noodles you’d typically find in regular soups. Adding kale to the soup offers a great way to get some added nutrition, especially for those who wouldn’t normally eat kale. The extra flavors of the soup mask the bitterness of the kale. This is a no carb soup that’s sure to hit the spot. 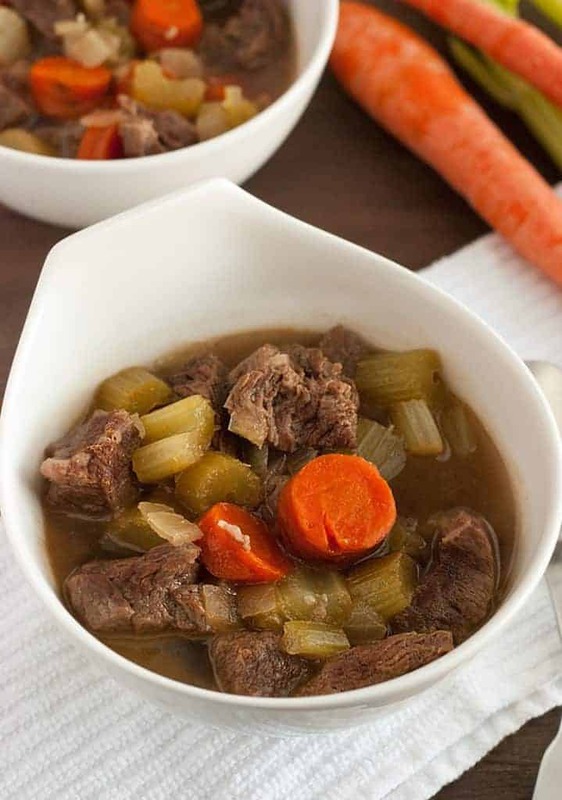 You don’t have to worry about carbs when you’re craving the classic taste of beef stew. It’s a soup that makes use of many low-carb foods. The key to bringing out the great flavor is to allow the soup to cook for a long time in order to merge the flavors. A lot of people serve beef stew over noodles, which you might miss living the low-carb lifestyle, but you could consider making some from zucchini or even just have a bowl of the stew as a side dish. Many times, recipes call for using flour to thicken a soup. Not exactly a low-carb idea. This recipe would have traditionally used that method, but the blogger has revamped it into a low-carb soup recipe. You’ll especially love the flavor that the roasted poblano peppers add to the dish. Want an even richer flavor? Choose a sharp cheddar cheese for the recipe and you’ll be in heaven. 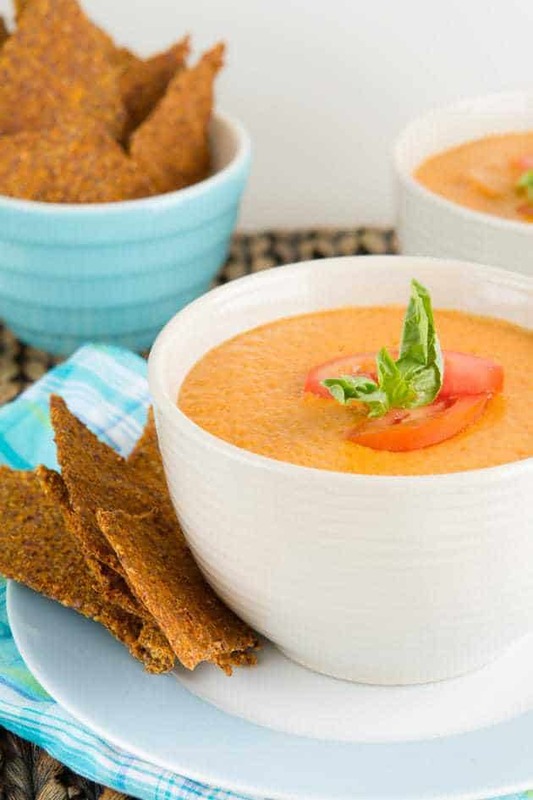 With cumin, chili, and paprika, this low calorie soup is sure to hit the spot, whether you’re looking for a side dish or a full meal. This chef makes an interesting point about the texture of the soup. The original recipe calls for diced onions and peppers, which add nutrition and flavor. However, if you prefer a smooth soup, you can easily use an immersion blender to puree these foods once they’ve cooked. 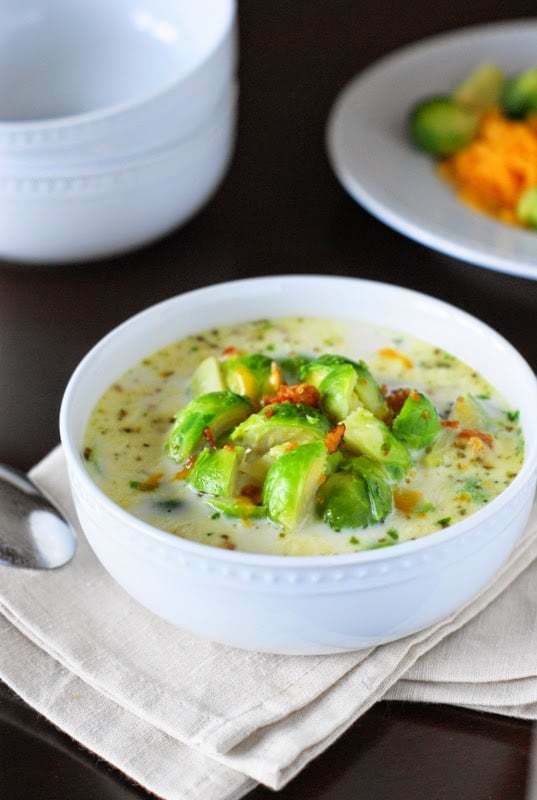 Chock-full of Brussel sprouts, this low-carb vegetable soup is a great choice for someone who loves the often-hated vegetable. The recipe calls for frozen Brussel sprouts, which is a good way to save some money. It’s a creamy and guilt-free dish, so eat up. When you’re following the low-carb lifestyle, you tend to eat some of the same foods over and over. If you’re sick of chicken and bacon, it might be time to try a little lobster. As-is, this recipe is dairy free, since it uses almond milk and xanthan gum to thicken it up. That’s great news for those who are lactose intolerant and still looking for low-carb recipes, which often make uses of heavy cream. Try this recipe and fall in love. If you’ve been eating low-carb for a while, you’re undoubtedly familiar with the idea of a “fat bomb.” Since you don’t eat carbohydrates, you have plenty of room in your diet to eat a lot of fat, which keeps you full and helps you lose weight. This soup has a lot of extra oil in it, significantly increasing the fat count. More than 60 percent of the calories come from fat. 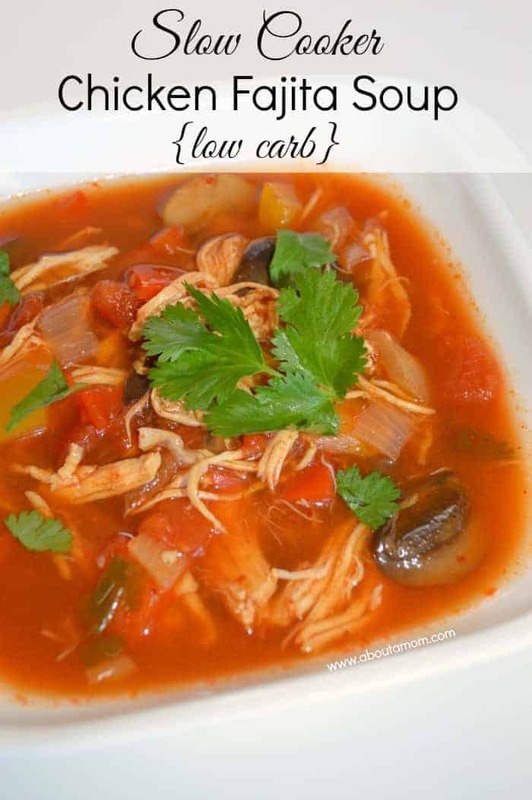 Not only is this low-carb soup yummy, but it will definitely fill you up and help you stick to your plan. 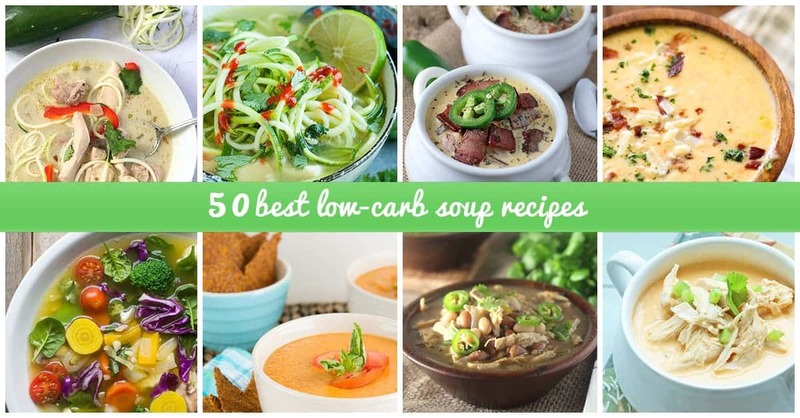 If you want low-carb soup recipes that pack a lot of heat, look no further. 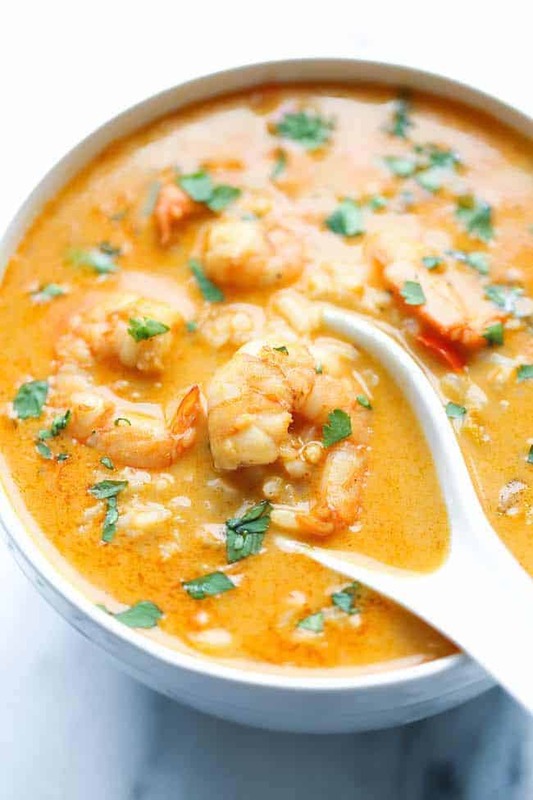 This Brazilian “moqueca” has traditional flavors like cumin, coriander, and garlic, then gets really spicy with the addition of Sriracha sauce. In Brazil, they’d use red palm oil to give It some color. You can buy this through specialty stores or on Amazon, but you can also substitute olive oil. 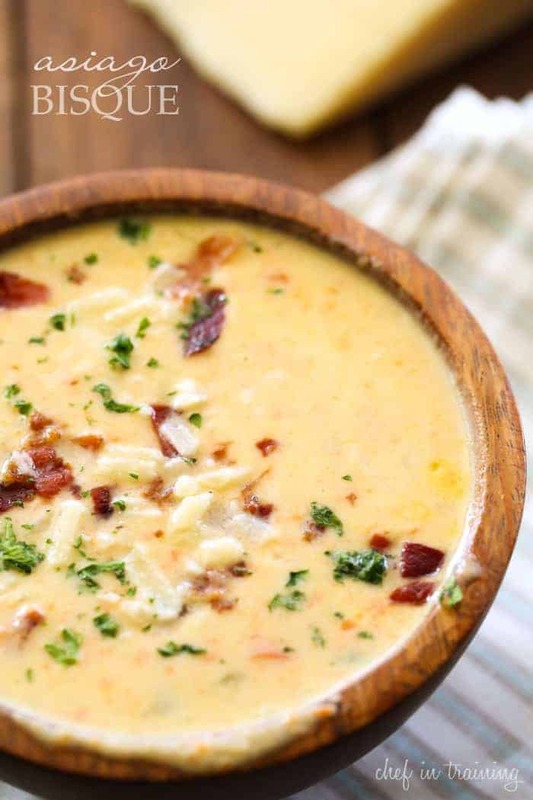 Cheddar soups are so creamy and velvety that they’re the perfect comfort food. As is, this recipe is not a carb-free soup because it includes potatoes as well as cauliflower. This does add a certain texture to the soup that many prefer, and can fit into some types of low-carb diets. However, you can also make this fit your plan by eliminating the potatoes. The choice is yours. Most soups are cold-weather favorites because they are so warm and comforting. However, this low—carb vegetable soup is the perfect summer food because you serve gazpacho cold. With a tomato base and fresh ingredients, you’ll love how light this soup feels in your stomach. Serve alongside a salad or some grilled meats for a complete summer meal. 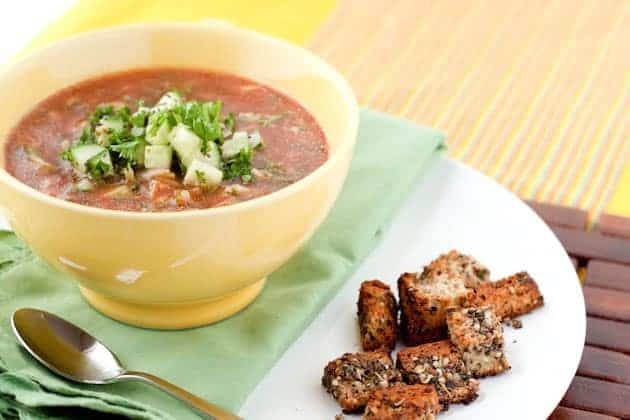 This is a low calorie soup that’s packed with fiber and flavor, so you’re able to eat as much as you want while still losing a lot of weight. When cooking this soup, make sure to use a low sodium broth to avoid the salt. High-salt foods can make you retain water weight. Without it, though, you’re sure to see the scale moving in a downward direction. 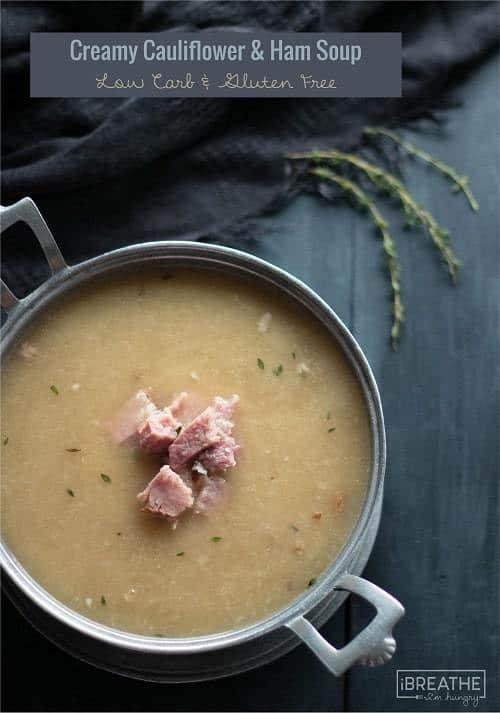 This no carb soup recipe is a great way to use up some leftover ham after a big family meal. If you have the time, you can even boil the ham bone down to make your own broth, but that’s hardly a necessity. Cook the cauliflower in the broth until it’s tender, then blend it up and throw in your leftover ham. A bit of liquid smoke adds a rich flavor to the dish. What could be easier than this? 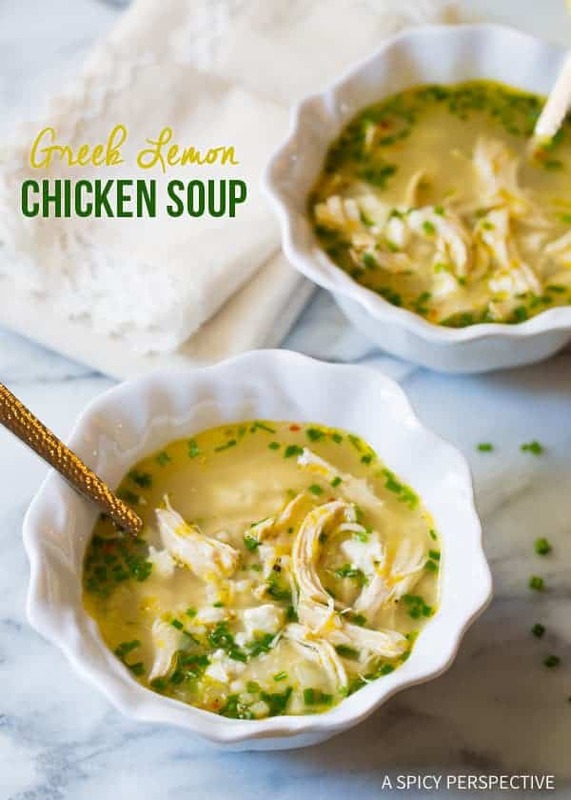 Lemon and chicken just seem to go together, and you’ll find both flavors in this low-carb soup recipe. The Feta cheese gives it a real Greek flair, and the way that it floats to the top makes it feel fun. Pearl couscous adds an interesting texture, but also carbohydrates. Eliminate them if you want to avoid the carbs or consider swapping for something else, like quinoa. With just a few ingredients, this carb free soup is easy to make, and it tastes so good that people won’t realize just how healthy it is. By using a vegetable broth in the soup, it’s perfect for vegetarians, but you can easily swap it out for chicken or pork broth if that’s what you happen to have on hand. It just changes the taste slightly. Sambel oelek, or fresh ground chile paste, adds the heat to this Thai-inspired soup, while the coconut milk cools things down. It’s got shredded chicken for protein, but what’s especially nice about this soup is the large amount of vegetables it includes as well. This will give you some of the extra fiber that you might be missing on your low-carb diet. One thing that really helps you stick with any diet plan is having a couple of quick-and-easy recipes in your arsenal. 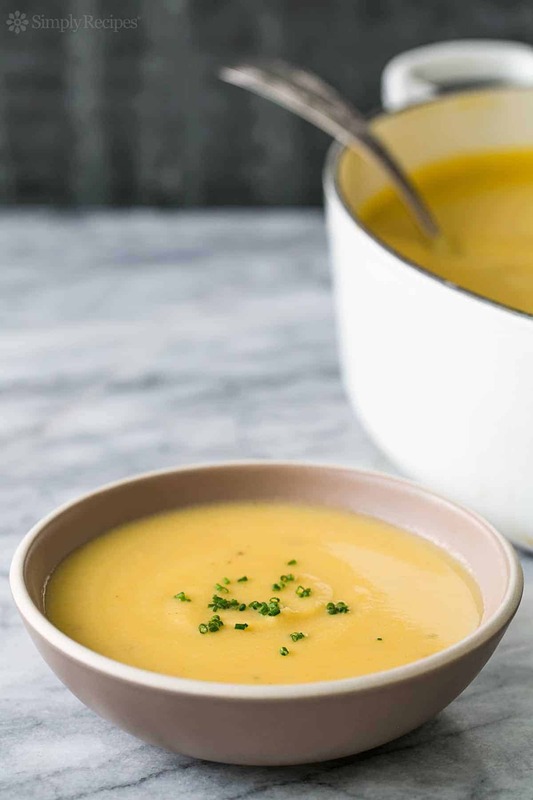 This low-carb soup recipe definitely fits that bill, and has the added bonus of making use of things you probably already have in your refrigerator. Vary the flavor each time you make it by using a different type of cheese. This is a good way to get your kids to eat their vegetables. 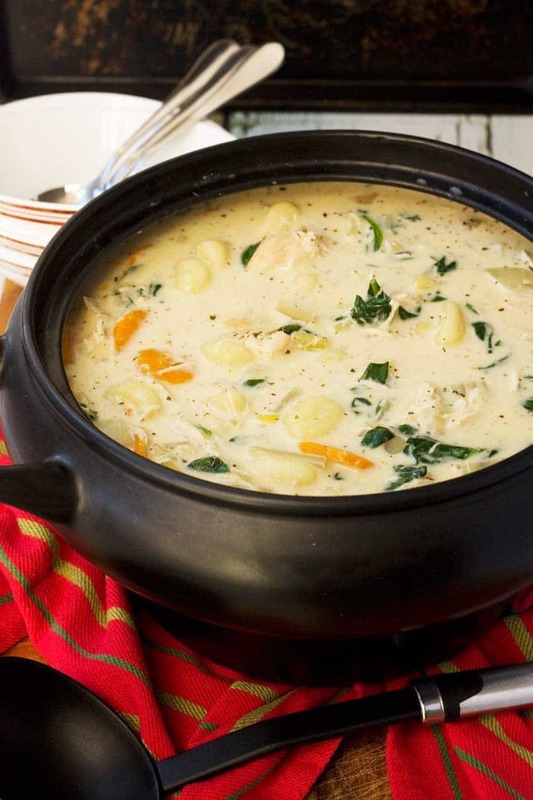 If you like the chicken gnocchi soup at Olive Garden, you’ll love this easy-to-make crockpot version. It’s got veggies and chicken simmered in a deliciously velvety sauce. While the gnocchi means that this isn’t exactly a carb-free soup, you could eat them sparingly or eliminate them all together. Throw the ingredients into the crock pot and come home to this delicious family-favorite meal. If you’re looking for a big burst of nutrition, look no further than this carb free soup. With spinach, avocado, and other vegetables, it might be the healthiest thing you eat all week. Best of all, it’s another soup that you can really enjoy in the summer, as it tastes just as good cold as it does warm. Alternatively, use it as a dip. It doesn’t get more versatile than that. 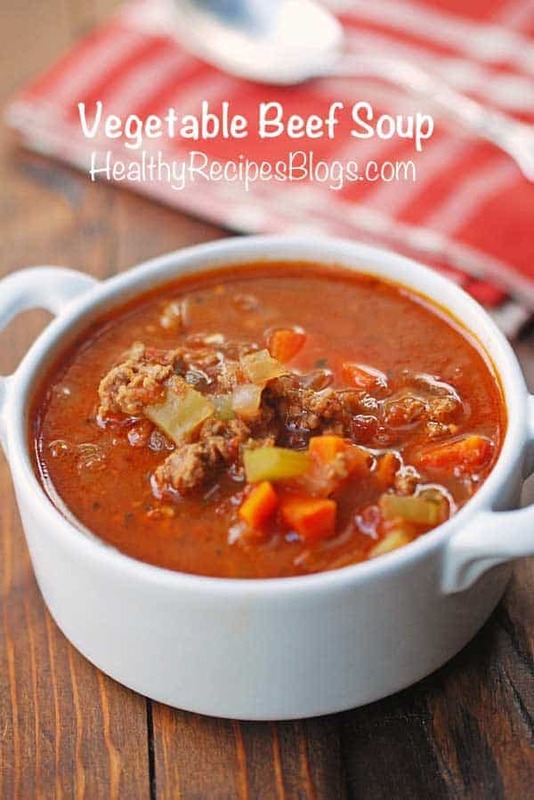 With the addition of ground beef, this low-carb vegetable soup has a bit more heft to it than the traditional vegetable soup, and it’s a great departure from the numerous chicken soup recipes you’ll come across. Serve it either as a main dish or a side, and don’t forget to top with the shredded parmesan cheese for that extra burst of flavor. 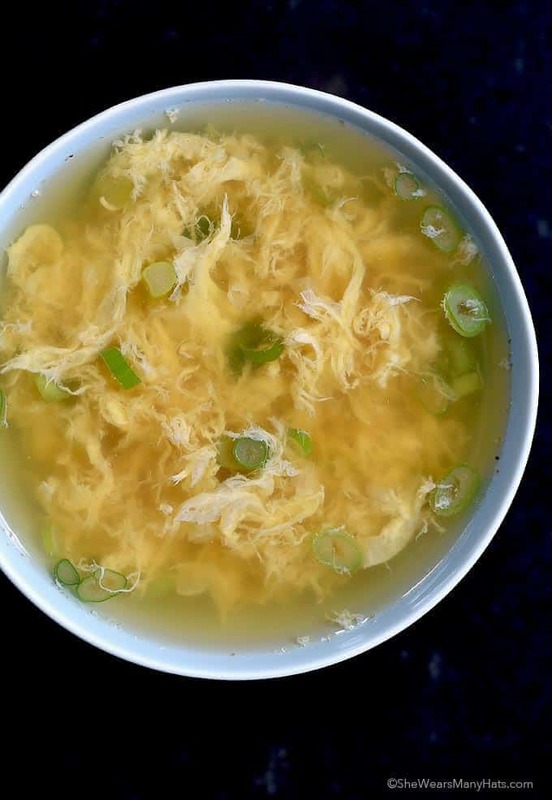 Egg drop soup is a staple in Chinese restaurants, and you might be surprised to find out how easy it is to make at home. Use fresh ginger in this recipe, as it has a much better taste than the powdered stuff. As you add the eggs, make sure to stir continuously, which is what really makes the eggs have that stringy texture you want. Otherwise, it will cook together in a clumb. This low-carb soup is sort of like having a cheeseburger in a bowl. 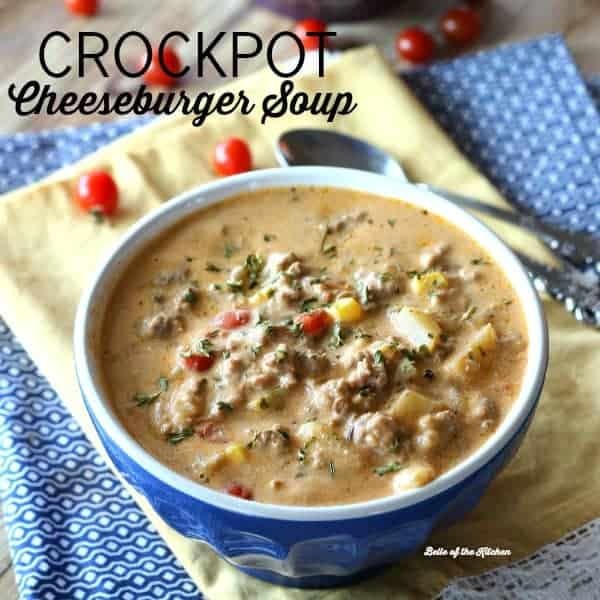 It has a few steps at the end to create the cheesiness, so it’s not quite as easy as other types of crockpot recipes, but you still don’t have to do a ton of work. Serve this on a winter’s day and dream of the summer cookouts you’ll be able to have in just a few months. Zucchini and chowder aren’t two words you often hear together, but they work surprisingly well in this low-carb soup. 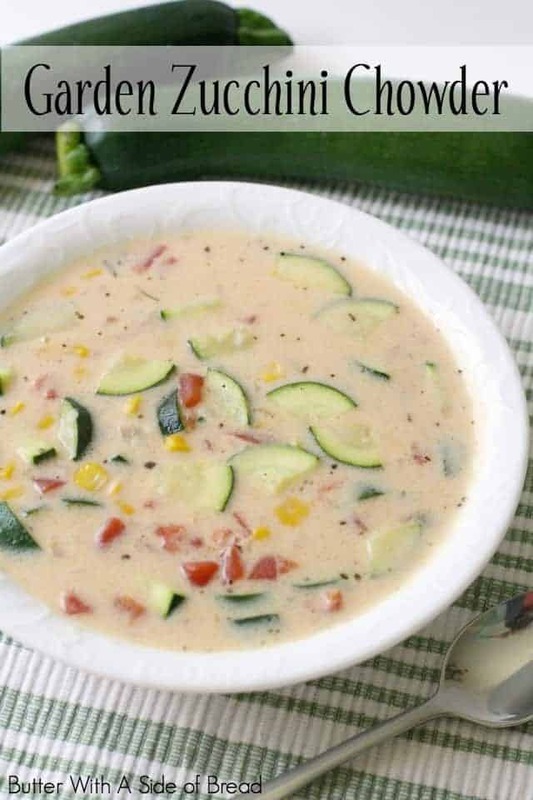 An important part of making this soup taste great is cooking the zucchini separately and adding it to the creamy soup at the end of the process. This prevents the zucchini from getting too soggy. Vegan recipes can’t use any animal products. To get the “creaminess,” many vegan recipes use blended nuts, which can significantly increase the calorie count. 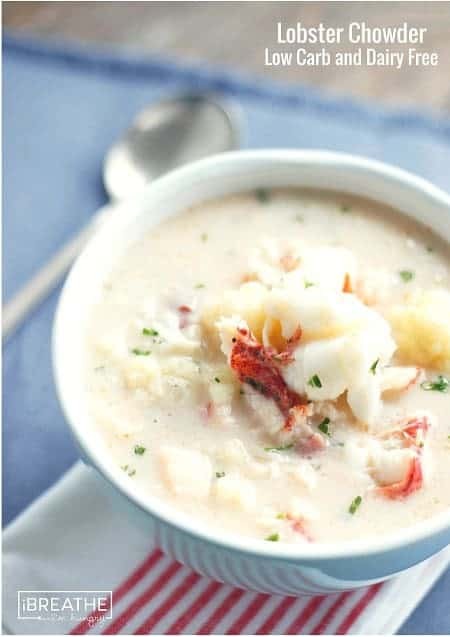 Instead, here you’re using cauliflower and almond milk to get that creaminess, making it a relatively low calorie soup that’s yummy and comforting to keep you warm on a cold day. If you’ve always loved ordering red curry at a Thai restaurant, you might be surprised to find out that it actually has a lot of sugar. That’s a big no-no on the low-carb diet. Instead, make your own version at home without all that unnecessary sugar. This recipe features some ingredients that aren’t common in American homes, such as red curry paste and fish sauce, but you can usually find these products online or in an Asian food store. 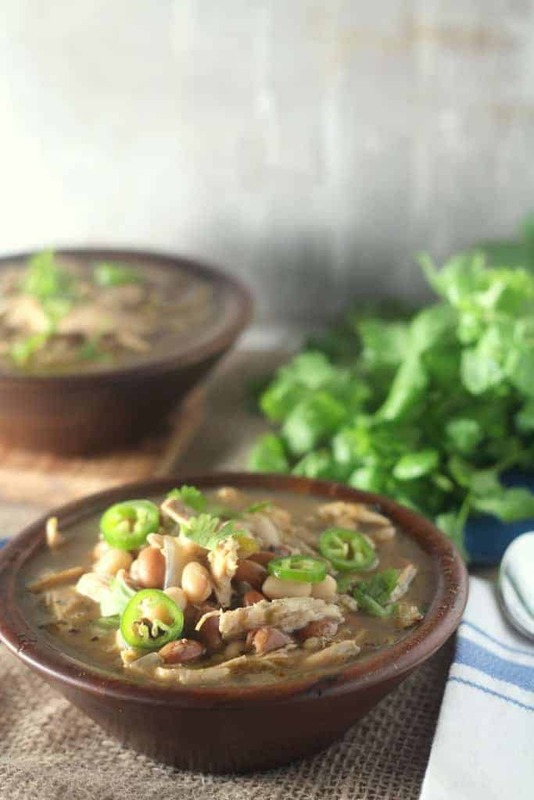 Spicy and delicious, this no carb soup will give you the Mexican flavors you’re seeking without the carbs in a tortilla. It does use beans, which can be high in carbohydrates and aren’t good for the early stages of the low-carb lifestyle. However, you can reduce the amount of beans or try eliminating them altogether if you want to eat this soup. As you can see, the low-carb lifestyle doesn’t have to be boring. There are plenty of ways that you can mix it up. Soups are an ideal food because you can almost always make changes to suit your needs without ruining the flavor. 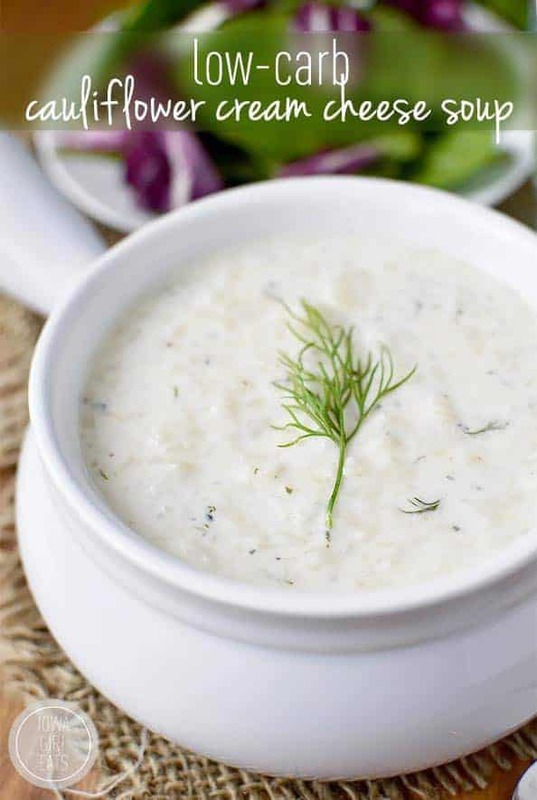 A low calorie soup is a good choice when you want something a bit lighter or a good side dish with your meal, while higher-calorie low carb foods like cheeses and full-fat creams can help you feel full. 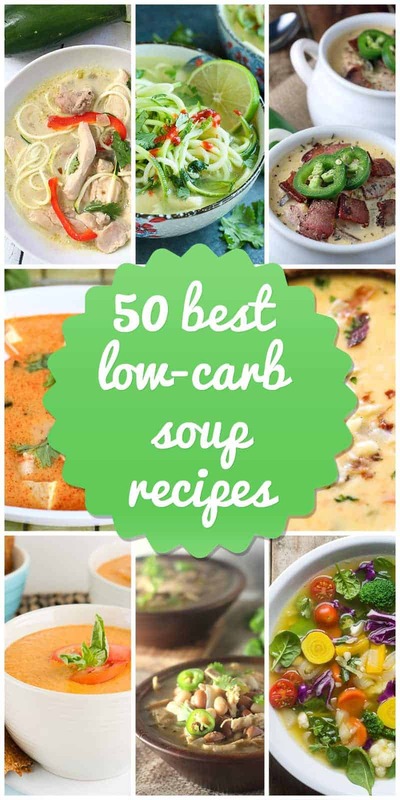 Whether you have a taste for low-carb mushroom soup or a hearty cheesy soup, you’re sure to find a variety of soups to tickle your taste buds. Use them as a full meal or a side and watch your extra weight just slide right off without a lot of effort on your part. All you need to do is eat healthily.